The skin on my hands had wrinkled as if they had been submerged in a tub of water overnight. The extended forecast called for rain mixed with showers. Believe it or not, in the Pacific Northwest, there is a difference between rain and showers. This was definitely rain, and I knew that if it didn't stop soon it would put the kibosh on my plans to fish again the next morning. I worked through the run methodically, rain pouring down, the wind kicking up from time to time, and the light growing dim. About an hour before sundown, I felt a subtle tug on the end of my line, I set the hook and for a instant, I felt a fresh Steelhead dance on the end of my line. Within moments, my smile turned into a grimace as the Steelhead came unbuttoned. A colorful series of expletives left my lips and I reeled up my line and hiked back through the undergrowth to my truck. I would have to wait until the rivers came back into shape before tempting fate once more. The rivers and forests of the Olympic Peninsula are a magical, mystical place for fly fisherman to explore. This is Jurassic Park. Deep dense forests, trees bearded with long strands of moss and ground covered with ferns add to the mysteriousness of this place. Strands of clouds hang in the creases of the forested mountains. Much of the time, it is so misty you can't even see the mountains.This place is home to Roosevelt Elk, Bald Eagles, River Otters, and Pileated Wood Peckers. This is also home to one of the most prized game fish in the the world, the Steelhead, Oncorhynchus Mykiss. To say that the Pacific Northwest, and more specifically, the Olympic Peninsula, is a wet place is an understatement. Moss doesn't just grown on the north side of the trees in the temperate rain forests of the Olympic Peninsula. 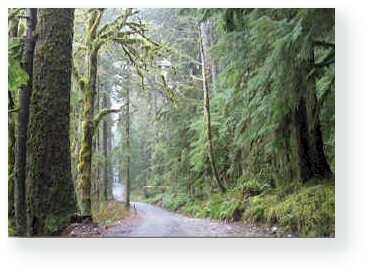 Yes, I did just use the term "rain forest". Some locations on the western side of the Olympic Peninsula may receive 150 inches of rain or more annually, and it can fall very heavily at times. During one storm over the Christmas holiday in 2002, the town of Forks received nearly 6 inches of rain in a 24-hour period, sending the Hoh river which had been flowing at around 2,000 cfs to over 40,000 cfs within short order. With that much flowing water, 200-ft trees are tossed about like match sticks, rivers banks are eroded, roads may be washed out, and river rock is re-deposited. 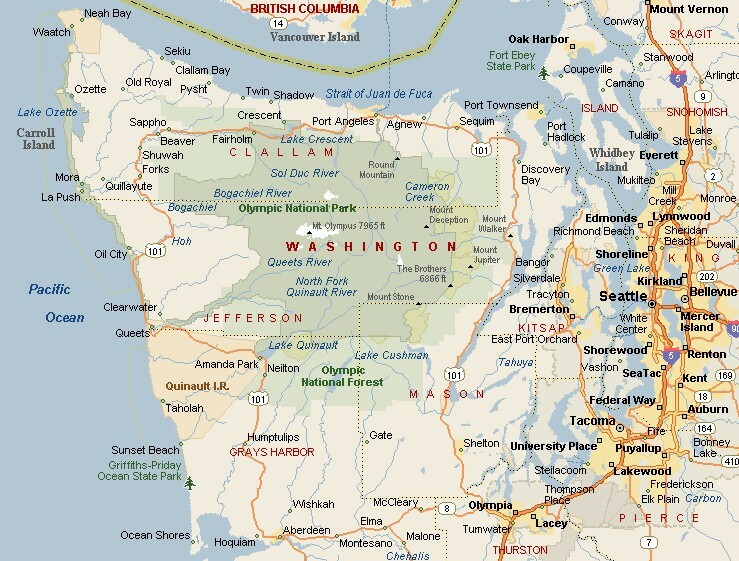 The Olympic Peninsula is surrounded on three sides by water, the Straight of Juan de Fuca on the north, the Pacific Ocean on its west side, and Puget Sound to the east. While there are numerous fishing options in the northern and southern regions, it is still the west side of the Peninsula that draws fisherman from around the world. The small town of Forks, WA, is the epicenter of Steelhead Central on the Olympic Peninsula. One can find lodging, food, and some essentials here. Restaurants are homey and non-sophisticated. Prices are reflective. Accommodations are generally inexpensive. In addition to motels, there are a number of camping options, including some with showers, within a 10-minute drive of town. Fly shops are non-existent so you'll want to bring along plenty of flies, leaders, etc. You may also want to bring along an extra rod and reel in case one gets broken. Within a short drive of Forks, WA, three large rivers combine and flow into the Pacific Ocean near the Indian settlement of La Push. 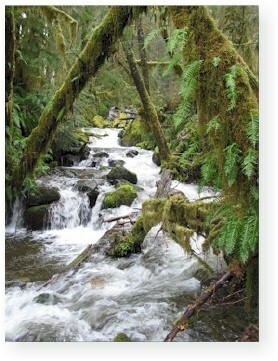 The Quillayute River system is comprised of the Calawah, the Bogachiel, and the Sol Duc. Further south, other famous rivers such as the Hoh, the Queets, and the Quinalt are equally impressive and produce good numbers of large Steelhead. In addition to these large rivers, there are also smaller, more intimate rivers to wet a line. One can spend a lifetime fishing these rivers. Before planning your trip, one thing to think about is that Steelhead, and the rivers they're found in, are on their own schedule. If you're going to be successful catching Steelhead, you're going to have to work your schedule around theirs, not vice-versa. Regardless of where you're coming from, it pays to do your homework and watch the weather and hydrology reports. Weather reports from the National Oceanic Atmospheric Administration (NOAA) are detailed and accurate and can help you determine if a brief dry spell will allow the rivers to drop into shape. Information related to river flow can be found through the United States Geological Survey (USGS). The graphs can help you to understand the rate at which the rivers are rising or falling. If the rivers are rising, you're going to have a tough time finding clear water to present your fly. After heavy rains, it may take considerable time for the flows to drop and the river to clear. By analyzing the graphs, you can watch the rate at which the rivers are receding and get a feel for what shape they're in. Not all rivers will have a hydrologic unit so you may have to use an adjacent river to get a feel for what is happening. Here is a short list of some the larger rivers with Hydrologic units: Calawah, Bogachiel, Hoh, Queets, Quinalt. By studying the graphs, one can determine when to head to the rivers. Before heading out to fish the Olympic Peninsula rivers, you need to have a game plan. You need to look at where you're going to stay, what the weather is doing, what shape the rivers are in, and which rivers you'd like to fish. If you're new to the Olympic Peninsula, you should try picking one river and spending multiple days learning access points and identifying the best water. Trying to fish multiple rivers without understanding where to go will waste valuable day light. It takes time to learn a river. If you can afford a guide, spend the money, it will save you money in the long run. Winter Steelhead fishing is a lesson in patience. You not only need to plan your trip between storms and optimum river conditions, you also need to realize what you're up against. Plan on casting and fishing for hours, maybe days, between fish. Some days may produce multiple fish, others may produce nothing. To be successful at catching winter Steelhead on the Olympic Peninsula, you're going to need to be persistent. You'll have to put up with rain, wind, and cold water temperatures. I've seen grown men cry like elementary school children after being subjected to winter Steelhead fishing . . . , ok, so I haven't actually seen anyone cry, but I recognize the look. One cannot underestimate how important it is to have the right attire When it rains on the Olympic Peninsula, it will test every seam of your waterproof clothing. Choosing the correct wicking fabrics, and wearing layered clothing will help keep you comfortable when mother nature decides to unleash her fury. In addition to the rain and wind, there will be some nice sunny days but they are somewhat few and far between. If you're not comfortable while your fishing you probably won't have the patience and dedication required to be successful. 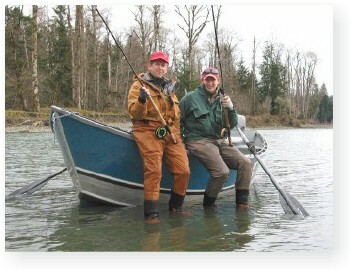 Many people who pry the large Northwest Rivers do not have the casting skill to allow them to cast tirelessly. If you go to the river not knowing what water to fish, and not having good casting skills, the odds are not in your favor. Being able to haul, and more importantly, double-haul will distribute the work and leave you less tired. If you're not able to hit your target with a maximum of 2-3 false casts, you're going to wear yourself out. And while its been said before it is worth reiterating, if your fly is not in the water, you're not going to catch fish. While long casts are not always required, they often are a fisherman's only hope of landing a fly where it needs to be and being able to throw 70 + feet of line using a variety of casts has it's advantages. 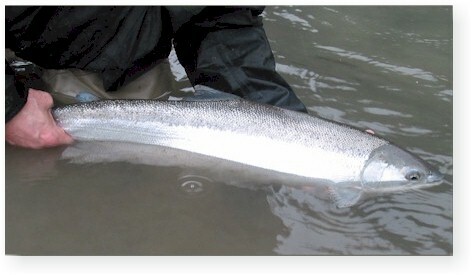 Single-handed rods in weights 7 to 9 will handle most Winter Steelhead. For fly lines for the single-handed rod, it's hard to beat a multi-tip system like the Rio VersiTip. The Rio VersiTip comes with multiple heads to put your fly in the zone under changing water conditions and depths. For large rivers like the ones listed above, Spey rods have many advantages over singled-handed fly rods. For those not familiar with Spey rods, they are long, double-handed fly rods typically 15 feet or greater in length. Spey rods, and more specifically, spey casting will put the the fly into the zone with a minimum of effort.Long double-handed rods will handle heavy flies and tips more easily than single-handed rods. Spey casting will minimize the time that the fly is out of the water and long rods will mend a fly line like no other. One quick suggestion as it relates to any casting, you'll be far better off if you arrive at the river with the casting skills necessary to complete the job. Thrashing the water, and as some call it, "Spray Casting" is a lesson in frustration and will spook any would be fish from taking your offering. Take time to practice before you arrive. Hatchery Steelhead begin entering the many river systems sometime in late November with numbers peaking in December. From January through the closing of the season in April, the large native Steelhead make their way in from the roily Pacific Ocean. February through April are prime time to plan a trip to encounter native Steelhead. Check this link to view the latest fishing rules and regulations: Olympic National Park Fishing Regulations. If you are fishing within park boundaries, you do not need a license to catch and release. If you cross outside of park boundaries you will need a Washington State fishing license. You can purchase your Washington State license online by going to WDFW Licensing. Please practice Catch and Release for ALL WILD STEELHEAD! While stocks of native Steelhead are relatively healthy in many Olympic Peninsula rivers now, statistically speaking the stocks are still declining. This is one of the last places in the lower 48 where wild Steelhead are still somewhat plentiful. It would be a tragedy to see Steelhead populations decimated by people who think the resource cannot be exhausted. It is imperative that each fish hooked be returned to the river unharmed. New welcome regulations by the Washington Department of Fish and Wildlife have put a two-year moratorium on the harvest of Native Steelhead, effective May 1st, 2004. New regulations also prevent wild Steelhead from being removed from the water, even for a photograph. It is imperative that we follow these rules so we continue to have healthy populations of fish for generations to come. The town of Forks, Washington is easily accessed by following Highway 101 north from Aberdeen, Washington and/or following Highway 101 north and west of Port Angeles, Washington.